“I want to know one thing. What is colour?” – Pablo Picasso. 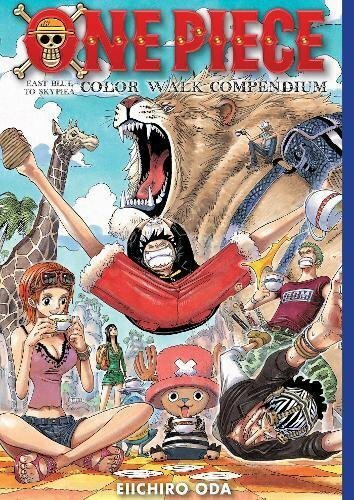 Colour collections of Eiichiro Oda’s work that were published in manga volumes in black-and-white have been around for a while – in Japan anyway. Of the eight “Color Walks” (they use the American spelling) only two have ever been released in English, and the last English release was six years ago. Now Viz are releasing hardback collections of these books. 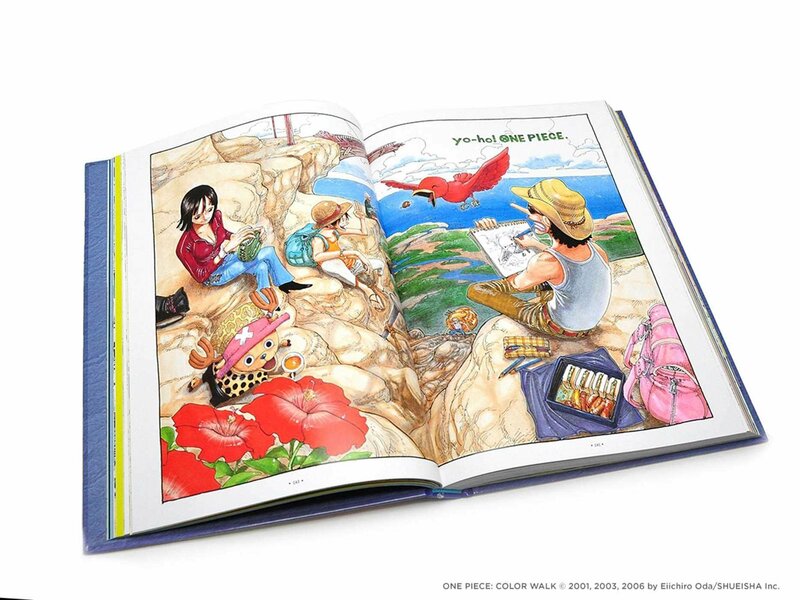 The first of these compendia deals with nearly 300 chapters of the best-selling manga, covering thirty volumes, from the start of Monkey D. Luffy’s adventures up to and partly including adventures in Skypiea. There is obviously not much in the way of writing in these books. What you get are glossy colour versions of pictures that were previously only released in monochrome when we English-speakers first got the manga. You do get some annotated notes along the way, and the beginning of the book includes a large double-sided foldout. There is a bit of an issue with the collection, which is when it comes to show images that span two pages, because the crease in the book does partly obscure the image, and it is harder to make out in a hardback book than in a paperback as you cannot bend the book as much in order to see the image more clearly. However, the overall quality of the art cannot be doubted. It is work like this that has seen Oda sell 440 million copies, which according to one source puts him just 20 million behind sales of Batman, 60 million behind Harry Potter, and makes him the 12th best-selling writer of fiction in the world. There are also some interesting early drawings in the book. One of his drawings is of an early version of Nami, which seems to depict her as part-cyborg with an artificial robot arm and leg, carrying a massive axe. Also, while there isn’t much writing, there are some interesting notes. One is when Oda comments that he felt the urge to punch a journalist who wanted to ask him if he ever had an instance of failure. For a more in-depth profile of Oda himself, the book also contains three chats he has with three other authors known as the “Monochome Talks”. These are with Dragon Ball’s Akira Toriyama, Doraemon’s Fujiko A. Fujio, and Final Fantasy illustrator Yoshitaka Amano. If there is anything really off-putting about this collection, it would simply be the price. The RRP is £28, and while it is a wonderfully presented book, you do worry that price will put off some potential buyers.